Sir Henry Savile (30 November 1549 – 19 February 1622) was an English scholar, Warden of Merton College, Oxford, and Provost of Eton. He was a Member of the Parliament of England for Bossiney in 1589 and Dunwich in 1593. He was the son of Henry Savile of Bradley, near Halifax in Yorkshire, England, a member of an old county family, the Saviles of Methley, and of his wife Elizabeth, daughter of Robert Ramsden. He was educated at Brasenose College, Oxford, where he matriculated in 1561. He became a fellow of Merton in 1565. He established a reputation as a Greek scholar and mathematician by voluntary lectures on the Almagest, and in 1575 became junior proctor. In 1578 he travelled on the continent of Europe, where he collected manuscripts and is said to have been employed by Queen Elizabeth as her resident in the Low Countries. On his return he was named Greek tutor to the Queen. In 1583, Lord Burghley appointed Savile, with John Chamber and Thomas Digges, to sit on a commission to consider whether England should adopt the Gregorian calendar, as proposed by John Dee. In 1585 he was established as Warden of Merton by a vigorous exercise of the interest of Burghley and Secretary Walsingham. He proved a successful and autocratic head of house, generally unpopular with fellows and undergraduates, but under him the college flourished. His translation of four books of the Histories of Tacitus, with the learned Commentary on Roman Warfare (1591), enhanced his reputation. He also sat in Parliament as the member for Bossiney in 1589 and for Dunwich in 1593. On 30 September 1604 Savile was knighted, and in that year he was named one of the body of scholars appointed to prepare the authorized version of the Bible. He was entrusted with parts of the gospels, the Acts of the Apostles and the Book of Revelation. Sir Henry Savile has been sometimes confounded with another Henry Savile, called Long Harry (1570–1617), who gave currency to the forged addition to the Chronicle of Asser which contains the story that King Alfred founded the University of Oxford. His edition of St. John Chrysostom in eight folio volumes was published in 1610–1613. It was printed by the king's printer in a private press erected at the expense of Sir Henry, who imported the type. The Chrysostom, which cost him £8000 and did not sell well, was the most considerable work of pure learning undertaken in England (involving consulting French Chrysostomians and the despatching of young researchers to the Imperial Library in Vienna and the Patriarchal Library at Halki and other leading monasteries or collections) in his time. At the same press he published an edition of the Cyropaedia in 1618. In 1596 Savile produced the first printed edition of the first four books of the Gesta Pontificum Anglorum – an ecclesiastical history of England written by William of Malmesbury in the early 12th century. Savile used Cambridge University Library MS Ff.1.25.1 as his source for this, which was a copy of a copy of the original manuscript. 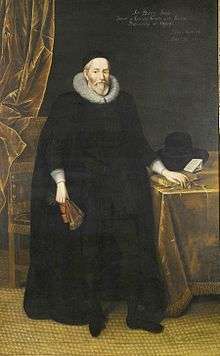 A brother, Thomas Savile (died 1593), was also a member of Merton College and had some reputation as a scholar. In 1604 died the only son born of his marriage in 1592 with Margaret, daughter of George Dacre, of Chesham, and Sir Henry Savile is thought to have been induced by this loss to devote the bulk of his fortune to the promotion of learning. His surviving child Elizabeth married Sir John Sedley and was mother of Sir Charles Sedley. 1 2 Goulding, R. D. "Savile, Sir Henry (1549–1622)". Oxford Dictionary of National Biography. Oxford University Press. Retrieved 1 March 2013. ↑ Hammer, Paul E. J. (1999). The Polarisation of Elizabethan Politics: The Political Career of Robert Devereux, 2nd Earl of Essex, 1585–1597. Cambridge University Press. p. 302. ISBN 0521434858. 1 2 "SAVILE, Henry II (1549–1622), of Oxford and Eton, Bucks.". The History of Parliament online. The History of Parliament Trust. Retrieved 1 March 2013. ↑ White, Henry Julian (1906). Merton College, Oxford. pp. 93–94. ↑ Womersley, David (August 1991). "Sir Henry Savile's Translation of Tacitus and the Political Interpretation of Elizabethan Texts". The Review of English Studies. 42 (167): 313–342. doi:10.1093/res/xlii.167.313. JSTOR 518347. ↑ "SAVILE, Henry II (1549-1622), of Oxford and Eton, Bucks.". History of Parliament Online. Retrieved 10 October 2016. ↑ Birch, Dinah (2009). The Oxford Companion to English Literature. Oxford University Press. ISBN 9780192806871. This article incorporates text from a publication now in the public domain: Carr, William (1897). "Savile, Henry (1549-1622)". In Lee, Sidney. Dictionary of National Biography. 50. London: Smith, Elder & Co. p. 367.